Rugby: will the real Wallabies and England please stand up? BIG GAME PREVIEW: With so much to play for both teams and the rivalry that comes out between England and Australia, we should expect a classic. These two rugby superpowers have had poor seasons to say the least, which makes the annual Cook Cup contest on Saturday vitally important for both teams. England and Australia have flattered to deceive over the last 12 months with good results and brave near misses interlaced with poor defeats. They are both rugby superpowers that should be among the contenders to challenge Ireland’s and the All Black’s quest to win the World Cup next year. On current form, it is difficult to see the Wallabies replicating their excellent 2015 campaign. With England, they have gone from nearly beating New Zealand to just about struggling past Japan. Australia was little better against Italy. So, predicting a confident winner at Twickenham on Saturday is no easy task. The formbook would suggest England, given that they have won the last six encounters against Australia. They will also field most of the team that found a way to win against the Springboks and fronted up against New Zealand. Eddie Jones has been under almost as much pressure as his old mate and counterpart Michael Cheika. With injuries ruling out some of his key players and continued questions around his training methods, a poor autumn series could have been Jones’s last in charge as England coach. Credit where it is due because Jones has pulled it back and got his team firing again, albeit with a lot of work still to do. Previously third or fourth choice players like Newcastle’s Mark Wilson are now sure-fire starters and Jones has the luxury of having pleasant selection problems again. As for the Wallabies, they still have world-class talent to choose from, which makes their inconsistency infuriating. The tireless backrowers Michael Hooper and David Pocock would walk into most teams, as would Israel Folau and Kurtley Beale. Bernard Foley and Will Genia are up there with the best in the world as well. So why are the Wallabies not winning on a more regular basis? The general malaise surrounding Australian rugby has not helped. Every year we continue to hear about the struggling franchises, lack of funding, low crowd attendances and player disciplinary problems. Australia needs their national team to win consistently, both home and away. It is a lot of pressure to take on but the Wallabies and Michael Cheika have to find a way. At the moment, they are not good enough. A win at Twickenham against their oldest enemy would give Australia a massive boost ahead of a huge 2019 campaign. They can do it even though their spluttering victory against Italy last weekend brought out more questions than answers. 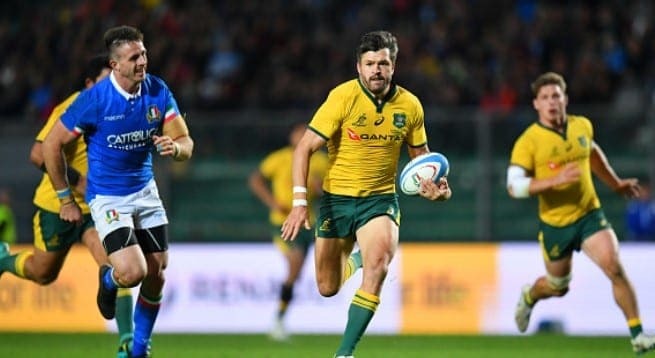 Adam Ashley-Cooper had an excellent return to colours and the Wallaby defence kept out wave after wave of Italian attacks late in the second half in an impressive defensive rearguard. The reality though is against the big boys they would have been beaten. For the England match, Australia’s experienced players must step up. Hooper, Pocock (if fit), Genia, Beale, Folau and Foley all has to show the way for the younger members of the team. The likes of Dylan Hartley, Owen Farrell and Ben Youngs have all stepped up for England in recent weeks, taking more responsibility on because of the absence of so many players. The Wallabies must do the same. Inevitably the gain line battle will be key and Hooper and Pocock must assert their brilliance in this area of the game. Turnovers will create space and attacking opportunities for Folau and Foley to exploit. Up front, Australia must try and get parity over England’s improving pack who are still shorn of the Vunipola brothers and other first teamers. That means getting the lineout right, scrummaging powerfully and creating a platform for centurion Genia to launch his dangerous backline. If the basics don’t go well, neither will Australia. At home and with a much-improved autumn campaign under their belt, England rightfully go into this game as favourites. Their second string did not go well against Japan but this will be a vastly different team against the Wallabies. England have improved their defence and they have enough pace and trickery out wide to trouble Australia. With so much to play for both teams and the rivalry that comes out between England and the Wallabies, we should expect a classic. England to win by seven points.